Be warned that this is a picture heavy post. I can't help myself. 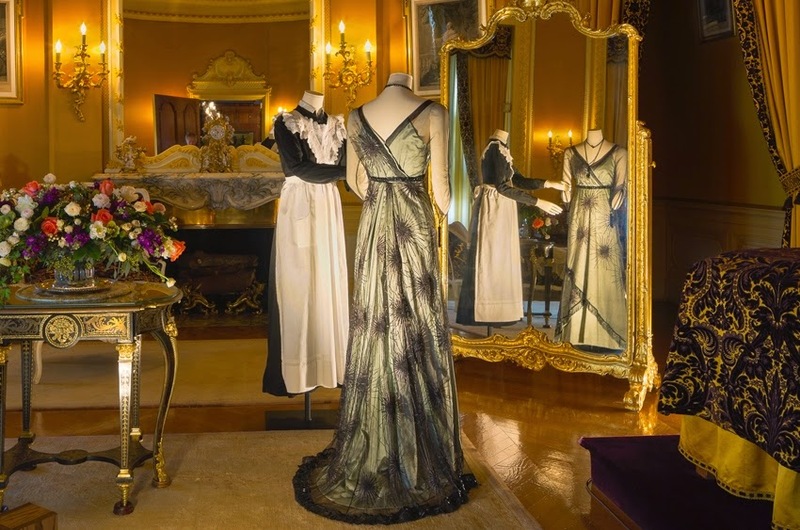 For my birthday, my parents bought tickets to see Dressing Downton, an exhibit of costumes from the first four seasons of Downton Abbey on display at the Biltmore Estate. We went the other day and it was fantastic. 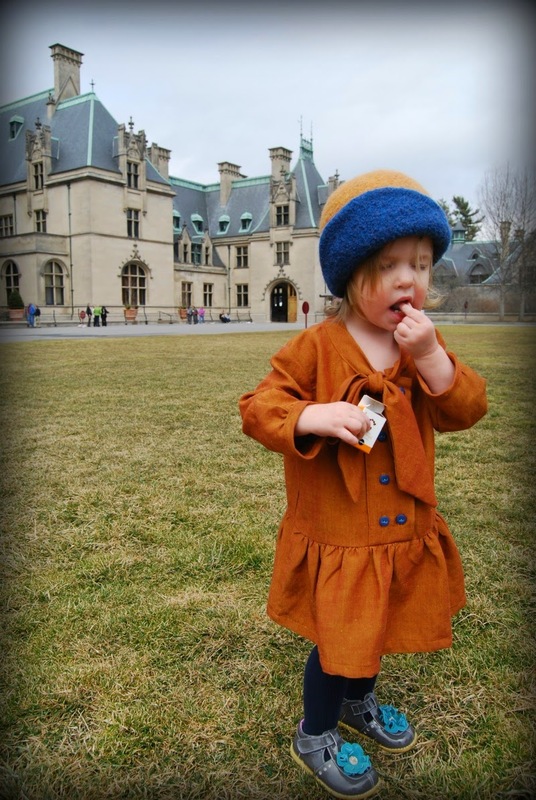 If any of you out there are near Asheville, NC- go. It was well worth the visit. 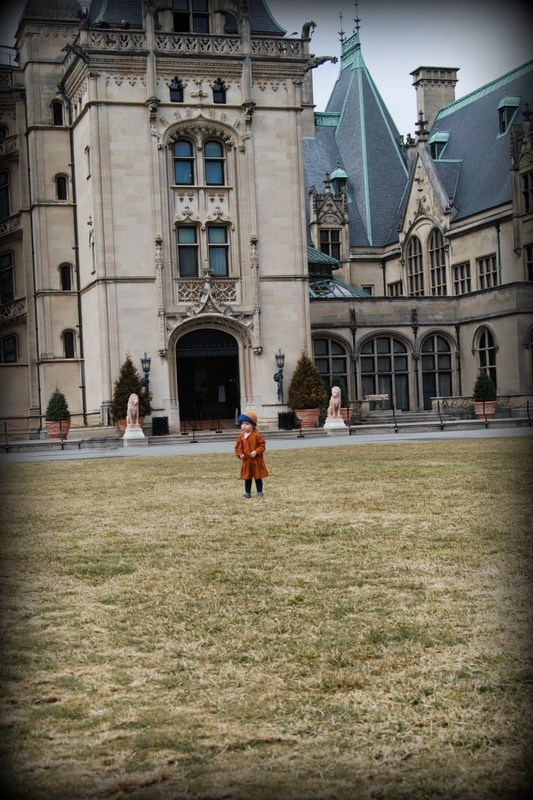 I've been to the Biltmore before but it was especially enjoyable this time with the costumes included in the setting. Each room on the tour had a costume or two. 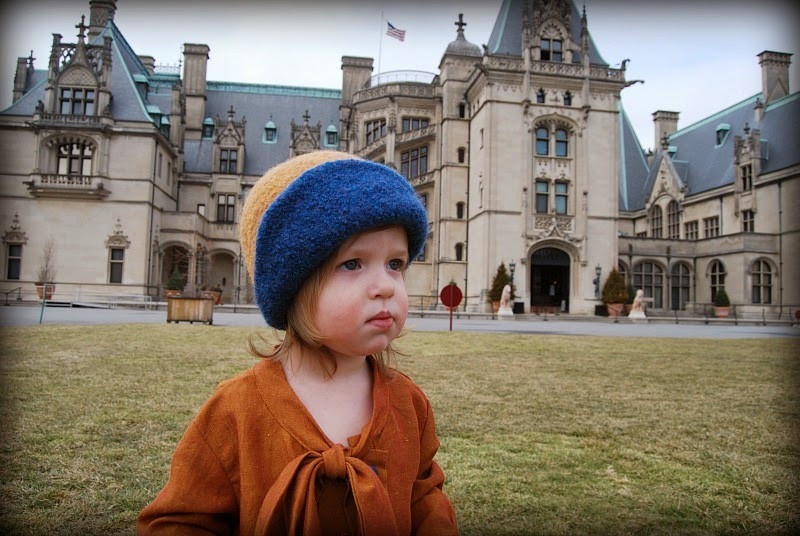 I borrowed the quote and photos from the Biltmore site about the exhibit. The pictures on the web don't do the costumes justice. You really need to see them in person. 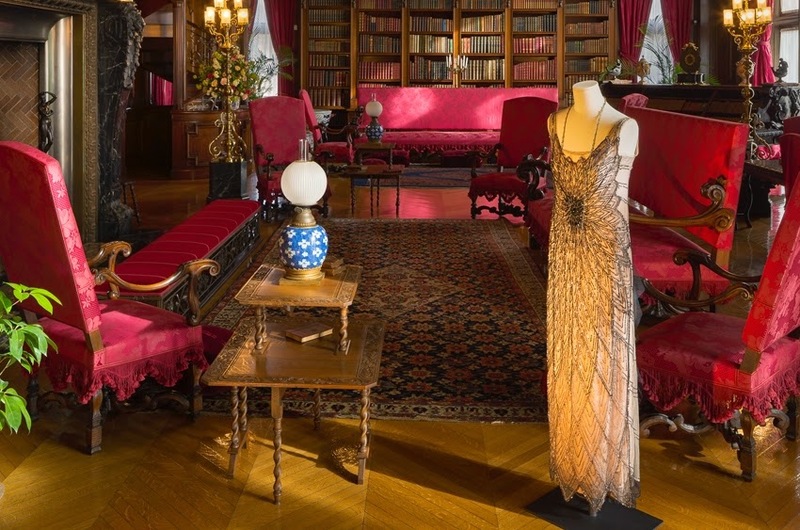 Some pieces are actual clothing from the era and some were made specifically for the show. 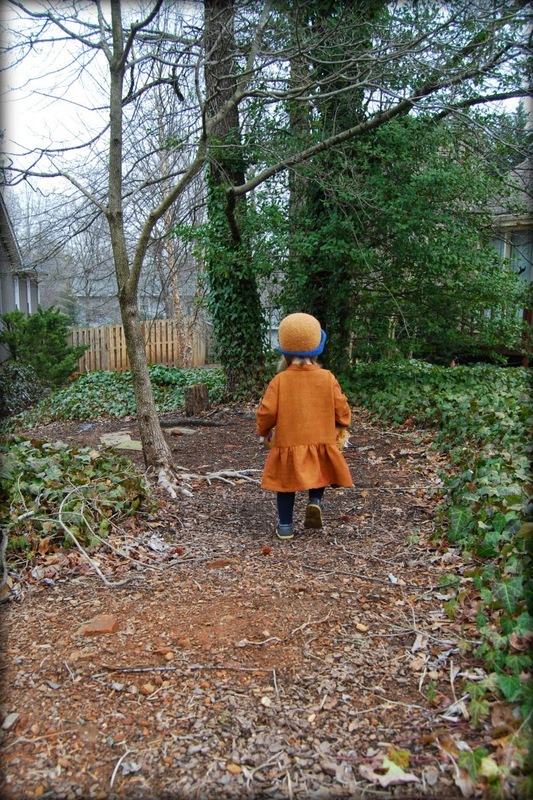 One jacket was made from a vintage tablecloth. The beading and overlays (and jewelry) were incredible. What an opulent time. Well, for the aristocracy anyway. Even the menswear was extravagant, though not nearly as exciting as the gowns. So anyway, let's get to this cuteness, shall we? This whole outfit was sparked by the hat. My aunt made this little cloche for Jane for Christmas. My talented aunt who knits beautiful things for Jane. 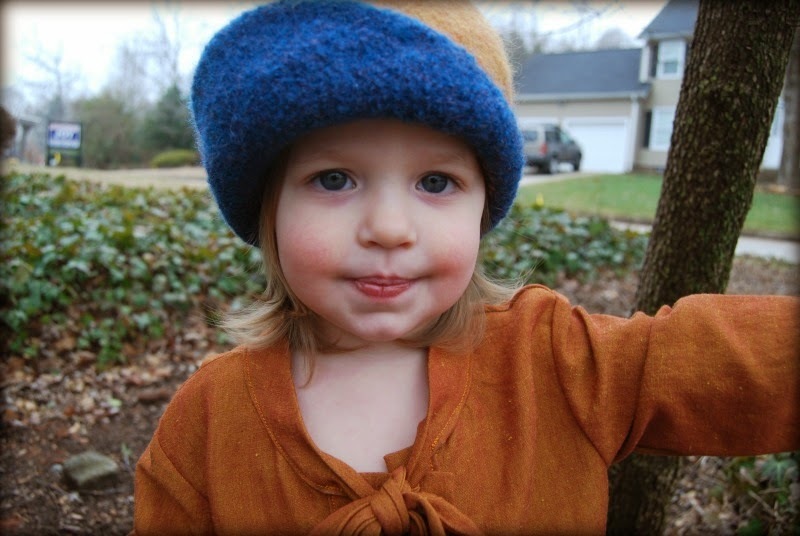 She has recently ventured in to knitting and felting hats. She had two of her hats featured in a museum show. We all agreed at Christmas that the cloche was very "Downton Abbey." So when it was set in stone that we were all going to see Dressing Downton, I decided that Jane needed a dress to go with her hat. I did extensive research first. Ha, just kidding. 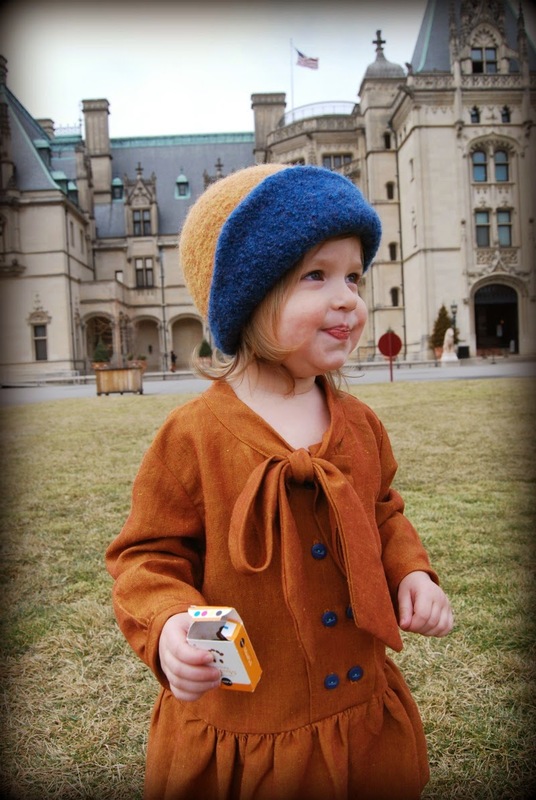 I did a quick google search of what children wore during the early 20th century. And then this pattern came to mind- the Apple-picking Dress from Oliver and S. Which I just so happened to have in my pattern stash. The pattern has a real vintage feel, doesn't it? 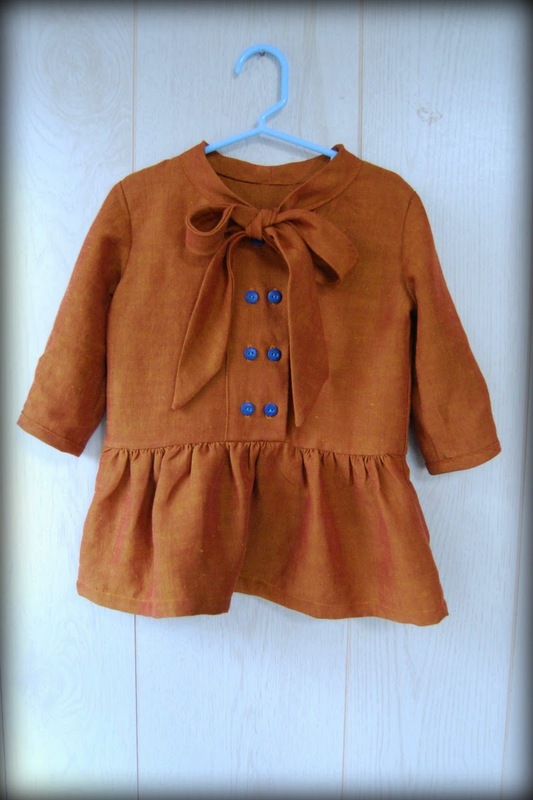 I thought the bow collar, drop waist and double button placket were perfect for the time period. I also had this iridescent rust colored shot cotton in my stash, too. Which just so happened to match the cloche. This was definitely a serendipitous project. I bought the fabric several years ago so I'm not one hundred percent sure it's all cotton. I suspect that there may be some silk in it because of the way it felt when I washed it and the fact that it shifted every which way when I was sewing with it. That's my excuse anyway. It was not a well behaved woven. I had trouble pressing seams flat and top stitching because the fabric shifted around so much. Maybe it's just because the weave is looser. Anyway, don't look to closely at my top stitching. I found parts of the pattern to be somewhat difficult. The top of that wide placket where the bow collar meets has to be trimmed very carefully. I didn't do such a great job, but it's passable. The proportions are a little different on my version because I made a size too big and shortened everything. Jane is wearing a 2T now but for some reason I thought I'd go up a size for some growing room. That was a dumb decision because it was huge. I cut off the skirt and sleeve bindings and took up the hem of both. That's why I only have four rows of buttons instead of five. So the dress is wider than it would be had I used the right size. 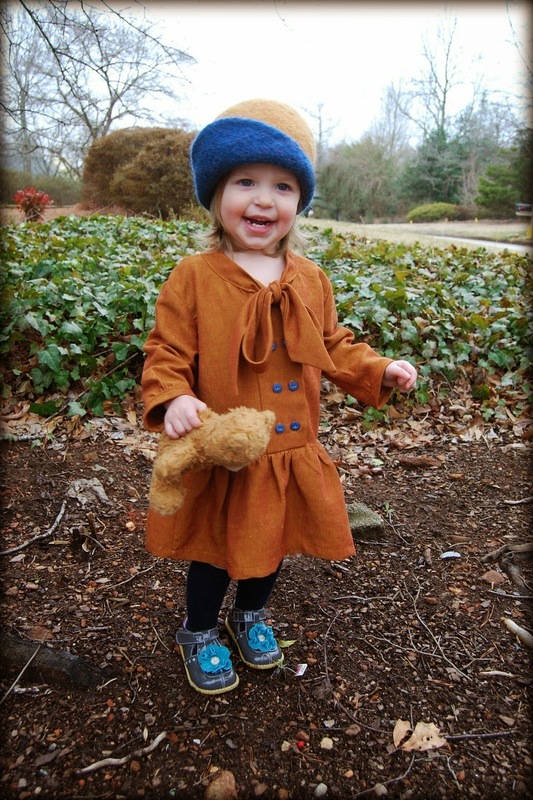 If it's too short in the fall (when I think she'll wear it more), Jane can wear it like a tunic. This photo above is my favorite. I title it, "Bribery With Raisins." 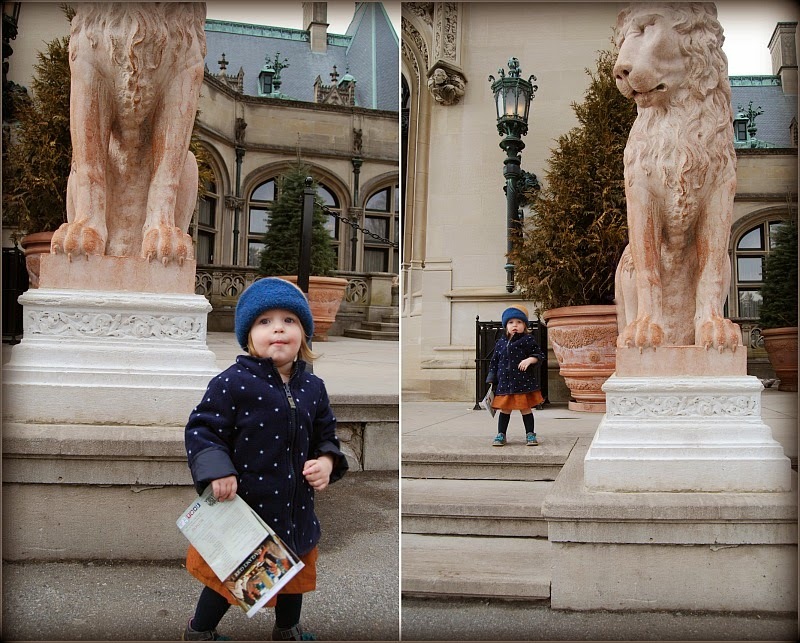 No pictures inside the Biltmore so we only got to take some out in front. And it was cold. I made her suffer though a few photos without her jacket. I also took some photos beforehand near the english ivy in my yard (see what I did there?). Fun times. It was a great exhibit and fun photo op for Jane. She is changing so much! She is looking more and more like a little girl everyday. 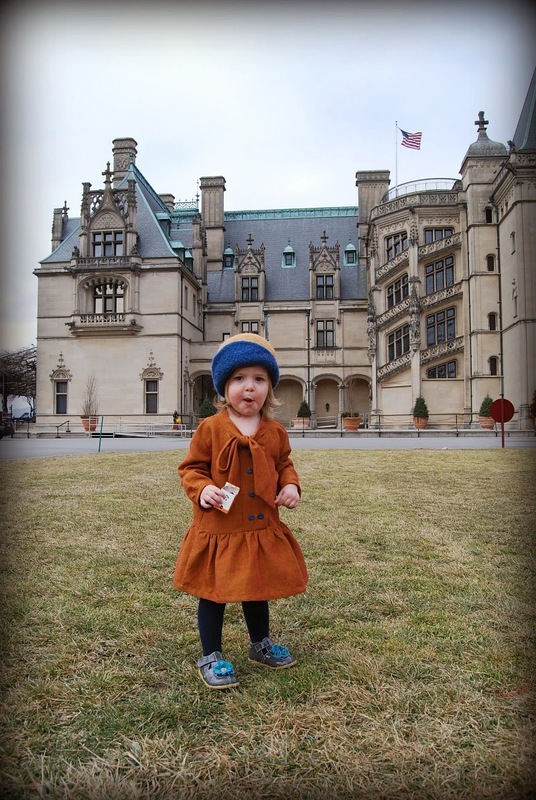 My almost two-year-old girl, if you can believe it. I am so glad to have these photos for posterity. 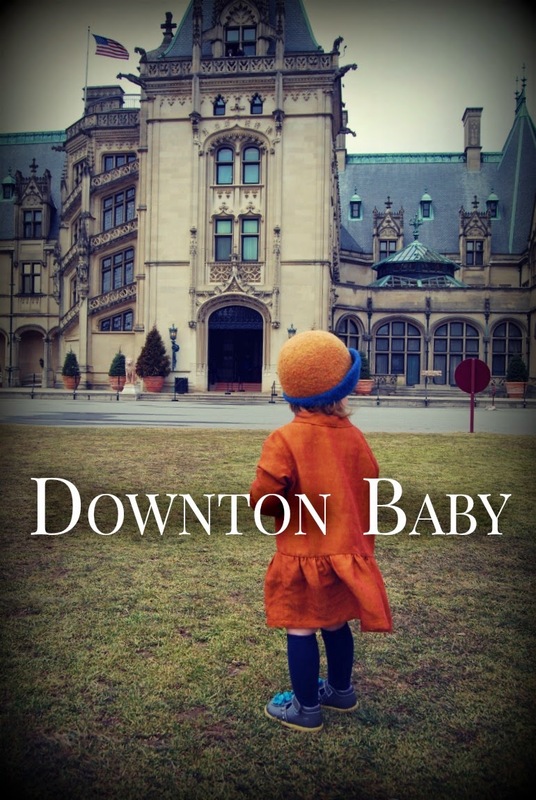 Any other Downton Abbey fans out there?